Mulgrave is a residential suburb 24 km south-east of central Melbourne between Glen Waverley and Wheelers Hill. 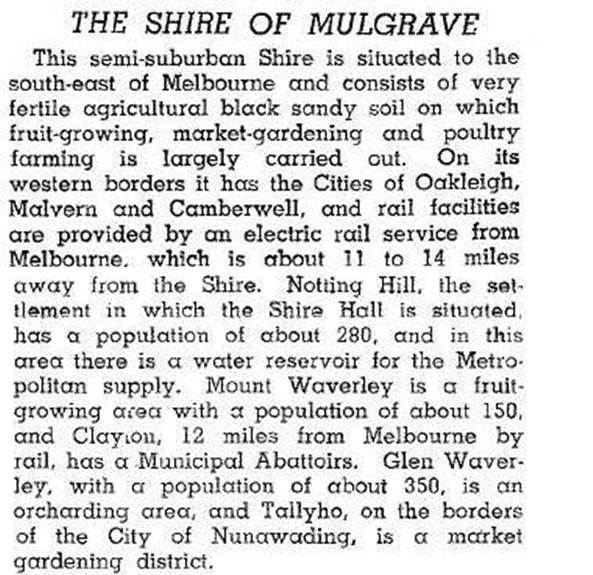 Prior to being the name of a suburb, Mulgrave was a shire and before that a parish. Oakleigh township was surveyed in 1853 but the remainder of the Mulgrave area was mainly used for grazing. During the 1860s the area was settled by small farmers, some of whom gained a little from prospective miners making their way to the Gippsland goldfields. The main eastwards routes, however, were Ferntree Gully Road and Dandenong Road, and the area that is now Mulgrave lay between them. Neither did Mulgrave lie on the Oakleigh to Gippsland railway (1879), and railway access did not come until 1930 when a railway line was extended from Darling to Glen Waverley, one suburb short of Mulgrave. Consequently Mulgrave was a rural village, with an Anglican church at the corner of Springvale and Wellington Roads (1869-1976) and a school (1861). Farms had dairy herds and grew vegetables and hay, and there were numerous orchards along High Street Road. The farming community continued in Mulgrave until well into the postwar years. Residential growth occurred at the public transport nodes. In 1962 Mulgrave offered a greenfields opportunity to the Victorian Football League which, wanting to lessen its dependence on the Melbourne Cricket Ground, built a stadium in Mulgrave (1970), taking as a cue the success of drive-in shopping centres and laying out hundreds of paved parking spaces around the stadium. VFL/Waverley Park at Mulgrave did not capture the affection of the football public. Three years later the first section of the Mulgrave Freeway was opened, ultimately linking east Dandenong to the South Eastern Freeway. Waverley Park was in an area of higher rainfall than central Melbourne. Viewing conditions could be cold and miserable, hence the description ‘Arctic Park’. The last AFL game was played in 1999, the year before the climate controlled docklands stadium opened. Despite the ground’s unpopularity the K.G. Luke grandstand (1976) was heritage listed and modified for community use that is shared with Hawthorn Football Club. The car park was turned over to housing, numbering 1400 dwellings. The freeway bisects the Mulgrave area from the north-west to the south-east corners. At these corners are the Brandon Park (1970) and Waverley Gardens (1977) shopping centres, strategically situated in their car based environment. (Brandon Park was a pastoral property owned by the Chirnside family after it disposed of most of its holdings at Werribee). The Springvale North Catholic Parish opened a primary school in Police Road in 1964 and Mazenod Boys’ Secondary College opened in 1968. Mulgrave has a few large reserves with ovals and facilities, and the residential areas have small neighbourhood reserves. Industry in the form of office parks, warehouses, food manufacturing and distribution adjoins major roads.